Daily Telegraph reveals Labour leader attended conference with Hamas leader Husam Badran who was jailed in Israel over terror. British Labour leader Jeremy Corbyn attended a conference with a convicted Hamas leader who was jailed in Israel for his role in orchestrating a string of terrorist attacks that killed more than 100 people, The Daily Telegraph revealed on Sunday. According to the report, the Labour leader hosted a panel discussion at a conference attended by a number of senior Hamas officials, including Husam Badran, who was given a 17-year sentence for his involvement in terrorist atrocities committed during the Second Intifada between 2001 and 2002. He was joined at the conference by Khaled Mashaal, the former leader of Hamas’ political bureau, who is on a UK sanction list, and Dr. Abdul Aziz Umar, who received seven life sentences for aiding in the preparation of a suicide belt, the British newspaper revealed. Badran and Umar were released by the Israeli government less than 12 months before the conference as part of the deal for IDF soldier Gilad Shalit, who had been taken hostage and held by Hamas in Gaza. Footage uncovered by The Telegraph revealed that all three men spoke at the two-day conference in Doha, entitled the “Seminar on Palestinian Refugees in the Arab World”. Three days after the conference, Corbyn acknowledged in his regular column in the Morning Star that he had listened to speeches given by men who had been released “in return for the Israeli soldier Gilad Shalit”, adding that “their contribution was fascinating and electrifying”. Sunday’s report is the latest in a series of scandals which have engulfed Labour and Corbyn. Dozens of Labour members have been suspended over their anti-Semitic statements. Just last week, the Daily Mail published photos of him at a cemetery in Tunisia holding a wreath near the graves of some of the Palestine Liberation Organization (PLO) terrorists who were responsible for the massacre of the 11 Israeli athletes at the 1972 Munich Olympics. 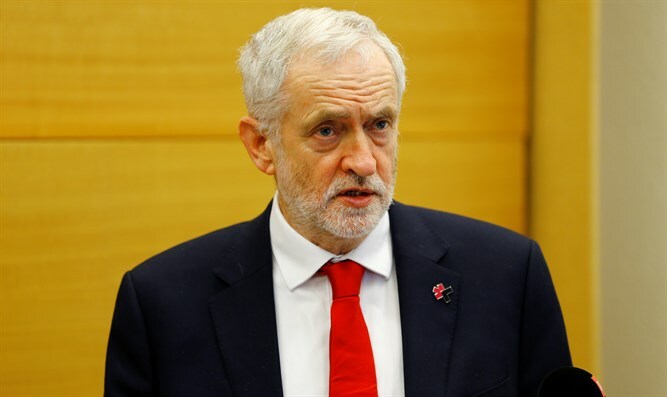 The Labour leader said he would not apologize for attending the event at the cemetery because he was trying to “promote peace in the Middle East”. Days later, a picture emerged of Corbyn apparently making a salute linked to the Muslim Brotherhood organization. A spokesman for the Labour leader explained he had been “standing up for democracy” when he used the Rabbi’ah symbol. Also last week, the Times of London published a picture of Corbyn meeting with the leader-in-exile of the Popular Front for the Liberation of Palestine (PFLP) terrorist organization, only weeks before its members carried out an attack on a Jerusalem synagogue in which six people were murdered.